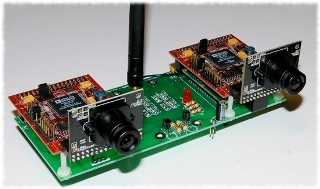 Manipulation of Surveyor SVS (Stereo Vision System) board. The class allows to manipulate with Surveyor SVS board (stereo vision system) - getting video from both cameras, manipulating motors and servos, reading ultrasonic modules' values, sending direct commands, etc. This class essentially creates to instances of SRV1 class to communicate with both SVS's cameras (ports 10001 and 10002 are used) and directs all calls through them.